On the western shore of a private peninsula, this newly built one bedroom cottage is the perfect place to get away from it all and relax. Surrounded by conservation land, the area abounds with wildlife. There is a queen size bed in the bedroom. The couch in the living room converts to a bed for additional sleeping accommodations. We just loved the nature surrounding this adorable cottage. We were able to relax even with two kids 4 and 7 years old. Just sitting out on the screened in porch was a vacation (amazing view of the water!). The cottage itself is so cozy and has everything you need. The owners are very welcoming and very easy to reach. Best Cottage we’ve ever stayed in! This cottage is just perfect! Clean, very comfortable, and privacy galor! There’s cottages in the area they are just set up perfectly. And, you don’t have to travel far to experience great areas of Maine. We were up there during the week of July 4th and it was so quiet, even on the holiday which was very nice. Such a fantastic vacation!! Absolutely wonderful 41st anniversary getaway! Absolutely wonderful 41st anniversary getaway! My wife and I enjoy the state of Maine in the fall .The Back River Cottages are in beautiful Georgetown, Maine and nestled amongst the pine and deciduous trees . Our cabin was quite secluded with views of the Back River .........we spent much time on the screen porch enjoying good food and drink with a peaceful serenity and all the comforts of home .Sam and Ruth Francis, the owners and managers of the cottages have passed the torch to their son, Chris and his wife, Katie. They were the perfect host and hostess. Our only regret was not having more time .....we only had two nights ..... a week would have been so much more enjoyable. This cottage is the definition of tranquility. It is nestled in the forest with an amazing view of the river from the screened in porch. We spent the weekend reading books in complete silence (something we normally get very little of with two small children at home) and popping into the many local towns to bump around the antique shops and eat amazing seafood meals. We highly recommend it and will be visiting again! We had an amazing stay. The Sheepscott cottage was wonderful for my wife and 2 year old daughter. The best part of hte cottage was the screened in porch. We enjoyed our morning coffee and evening conversation there. The cottage was secluded enough to feel like we got away but also close to a lot of fun day trips. Ruth was a wonderful and helpful host. If you are looking for a clean, quiet, peaceful getaway this is the place for you! 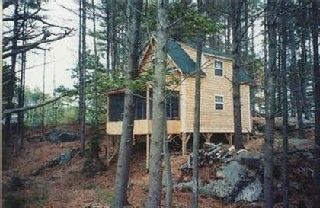 My cabin was cozy, well maintained and away from the stresses of traffic and noise yet close to the Maine amenities I came to see. Reid State Park and the city of Bath is less than a 10 minute drive in opposite directions. My dogs and I really enjoyed the nearby hiking trails, the views and overall peacefulness of the Back River Bend cottages. Ruth is a gracious, helpful and friendly host. I really enjoyed my time here and would come back again.